Want to Make Your First $1 Online? 9 Tips to Get It Done! There are a lot of options to make money online. Some are great, some are ways that you want to stay away from. In this post, I will be sharing the way I’ve made money online for the last 8 years. No hype, no empty promises, I will leave that up to the many scam sites that I suggest you stay away from. Just a quick advice… IF it sounds too good to be true, it probably is. But please don’t fall for the many scam offers out there. Ok, just wanted to get that out of the way. What I will be sharing with you today is how to get your own website up and running, also what to think about to get it ready to make that first dollar online. If you already have a site set up you can jump to tip #5. You might be asking yourself – why do I need a website? You have 100% control of your own site. This is not the case with social media, their site their rules, right. Doesn’t mean you can’t use social media to send traffic to your site… it can be a great way to get traffic. BUT, to stay in control of your own content, get your own site. Unlimited space and content. If you post stuff on Twitter you have 140 characters to say what you want to say. When you have your own site you can describe a product, you can do reviews, you can write content as long as you want… again it comes back to having control over your own site and content. Create something lasting. With your own site, you can build things over time, with more content you will get more traffic and hopefully more sales. IF you want to build something long term, something that can grow and potentially turn into a full-time business, I highly suggest that you create your own site. With today’s technology, it’s easier than ever. Your goal should be beyond making 1 dollar online, how about making some good side money or even a full-time income? How would that change things for you? The key is to provide helpful information and help people solve problems, the easiest place to deliver that is on your own site. The first thing you want to do is find a topic, a niche that your site will be about. This can be something that you are very knowledgeable about or very interested in. Pick something that you enjoy talking and writing about. This is your site, you decide what it should be about. Love makeup… start a site about it. Find something that you are passionate about and make your site about that. Authority Site – There are two types of sites and this is good to keep in mind when you decide on your niche. An authority site is a broad site that covers many smaller niche sites. An authority site takes time to build and it will earn authority status over time. An example of an authority site would be MensHealth or Entrepreneur. Niche Site – A niche site is a site that focuses in on a specific targeted topic. A specific health issue, for example, a specific product or specific way to get your baby to sleep… A niche site is very focused and very specific. That doesn’t mean that specific niche sites aren’t effective anymore, in fact, they can be very effective. If you write well written helpful content with a focus on a specific niche, using keywords you have a great chance of ranking your content well within the search engines. Know who your reader is and write for that person! Task 1: Find a Niche, a topic, that your site will be about. No worries if you have no idea what I’m talking about. It will all make sense in a minute. The domain is the URL the address you will need for your site. My domain name for this site is itsvicky.com. It’s the address to this site so that others can find it. The domain name has to be bought and will cost you around $10 yearly. When choosing a domain name you want to pick something that is easy to remember and relevant to your niche. Need tips on getting the right domain name, read how to find the perfect domain name. Hosting is where you will be storing all your website files. When you have a website there will be a ton of files for your content, images, plugins and more, everything that goes into your site will have to be stored somewhere, that’s what a host will do for you. The easiest way I have found is to get both domains and hosting at the same place. The reason for that is that you will have it all in one place, no need to point URLs to hosting, which can be a little confusing if you are new to this. Having both domains and hosting in one place will make your life a lot easier. Platform/WordPress. When you have gotten your domain and hosting it’s time to install the platform that you will be using. This is like the software the program you will need to get your site up and running. My preferred platform to work with is WordPress. WordPress is free, easy to install, easy to work with and has all the functionalities and looks you will need without having to do any of the techie coding stuff. Sure there is a learning curve to use WordPress, you will have to learn the basics. I have all the training you need right here though, so you do not have to do it alone. This includes information on how to get your domain, hosting and WordPress installation. When you have your site set up and running with WordPress installed, it’s time to pick a look for your site. This is done by choosing a WordPress theme. There are thousands of themes to choose between so I’m sure there will be something that you like and will go well with your site/niche. You can choose between a free WordPress theme or a premium one. We talk more about the differences about that here – 7 reasons to go premium with a WordPress theme. Starting out though it’s fine to use a free theme. Don’t spend too much time looking for a theme this is something that can be changed down the road so don’t get stuck. Make sure the overall layout goes well with what you want to do. Are you doing a plain blog, do you want a static front page, are you adding a store… make sure the theme goes well with your overall plan for your site. Pick something that’s easy to read. Black text on white background is the easiest to read. There’s a reason why most sites use this setup because it works. Make sure the theme is responsive/mobile friendly. Almost all themes are nowadays, but just make sure it is. This means that the theme will adjust and look well on all devices, smartphones, and tablets. Task 3: Pick a WordPress theme for your site. At this point, you want to install a few WordPress Plugins. A WordPress plugin is an addition that will help you do something without having to code it or do anything techie to your site. Install the plugin and it will do the job for you. Task 4: Install wanted plugins on your site. Written content like articles, reviews, information, stories. Images like screenshot, with a message, infographics. Submitting content to your site on a regular basis will build your site over time. Commit to a weekly schedule and try to stick to it. If you can do one article weekly that’s 52 in a year’s time if you can do 2 weekly that’s 104 a year. Find something that works for you and stick with it. If you write a post or page I would aim for at least 500 words. If you write in depth about something that should not be too difficult. The more you write the easier it will get. I used to struggle to get 500 words, today on this site my posts are often well over 2000 words. Why? Because I write about something that I’m passionate about and something that enjoy sharing. Many studies have shown that longer more in depth articles rank better in the search engines than shorter articles. Longer articles also tend to engage the reader better. How do you rank your content in the search engines? When you write your content you are first writing for the person that will be reading it. Make sure it’s engaging and helpful. You do want to make sure your content is SEO friendly as well though. This means that your content will have the chance to rank well in Google and other search engines. You want to rank your content organically in the search engines so that your readers can find it when they search specific phrases. If somebody type in “best car seats for toddlers” and that’s what your site is about, you want it to show up in the rankings for that search phrase. Task 5: Read – 10 Tips on how to rank content in Google and other search engines. Also, read – Keyword research explained. If you are looking for ideas for your content, look and see what others are writing about in your niche. Don’t copy and paste but get main ideas from similar sites. Take what you see and make it better! Need more help with ideas, 44 places to get unlimited site content ideas. Keep adding great content on a regular basis and you are on your way to making your first $1 online. We will need a recommendation or an offer though… that’s next. When your site has some great content to it, it’s time to start adding some relevant recommendations or offers. The key here is relevant! If you have a site about gardening, don’t suggest a money making product. If you write about tomato plants, then suggest where to get them, tell your readers what tools you use when you plant your tomatoes, tell them what pots are best… Keep your recommendations and suggestions relevant. There are many ways to monetize a site and to make money with it. Ads, affiliate products, your own products just to mention a few ways to make money with your site. Again key is to use what’s relevant. If your site is clearly relevant to a specific physical product than find companies with affiliate marketing programs that offer that product. One affiliate program that offers a lot of different products is Amazon. Amazon is not the only one though. Go to Google type in “product+affiliate program” and you will probably see a whole list of suggestions depending on your niche. If your site is more of a information type of site, then maybe an e-book or downloadable product is the way to go. Again the key is to stay relevant to your site and content. Writing in-depth reviews convert really well. I like linking from my general posts and pages to in-depth reviews. That way I keep them on the site a little longer, I get a chance to present my take on the product, provide the pros and cons, ups and downs, positives and negatives. That will help your reader to decide if the product is for them or not. Another thing that converts really well is top list comparisons like “top 5 car seats for toddlers” or 10 or whatever amount you have reviewed in that same category. You can compare products side by side with a comparison chart or you can list them. Pages like this can then link to your in-depth reviews. That way if you talk about toddler car seats in a post, you can link it to the top 5 page and from there link to the in-depth reviews. If you follow the above, read through all the suggested material and implement it you are well on your way to making your first dollar online. You will need to stay focused and consistent though. If your plan is to write two posts weekly, then write two posts weekly, not for one week not for two weeks but for a year or two or whatever you commit to… stay consistent. Jumping from one project to the next claiming this isn’t working is not the way to go. Stay focused on your niche, your content and what you have set out to accomplish. Implement what you learn, run with what works and adjust the things that don’t work. Another way to improve is to get feedback from other website owners. A great community to be part of and to get feedback from is WA. They offer step by step training when it comes to setting up your site, to get traffic and to monetize it. The community is phenomenal with live chat and direct messages, it also offers many other ways to interact and engage with each other. This is also a place for success stories and encouragement… because things might take a little time. Task 7: Read My WA review and see if this community is for you. Building a successful site is an ongoing project, it does not happen overnight. Have realistic expectations and know to be patient, because it will take time. To give you some realistic expectations I suggest you read my in-depth case study on one of my niche sites. I share real numbers, traffic, rankings, commissions, expenses and more. If you learn the basics, if you follow the step by step instructions with this program, if you stick with things and are patient there will be success. The way I see it if you want to do this, the only way to fail is to quit, the other issues along the way are just small bumps in the road. Believe me, we all run into them. Stick with it, implement what you learn, and great things will happen. It is very possible to make good money online, I see it first hand. If you follow the steps above and implement what you have learned, you are well on your way to make your first dollar online! Read my story how I got started making my first dollar online! You don’t need all the answers right away start taking action. Learn from your mistakes and adjust as you go. Task 1: Find a Niche, a topic that your site will be about. Task 7: Read – My WA review and see if this community is for you. 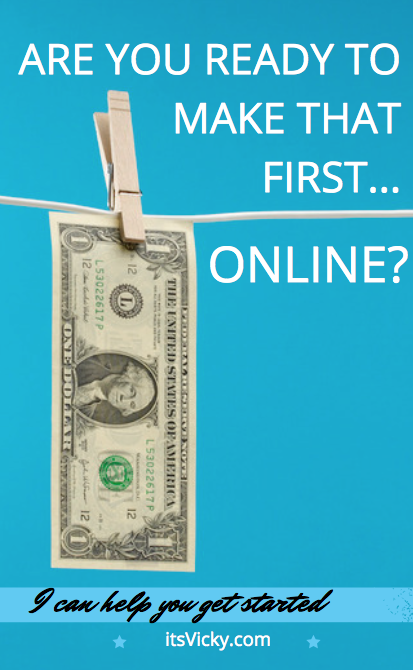 Read through and implement these and you are on your way to making that first dollar online! 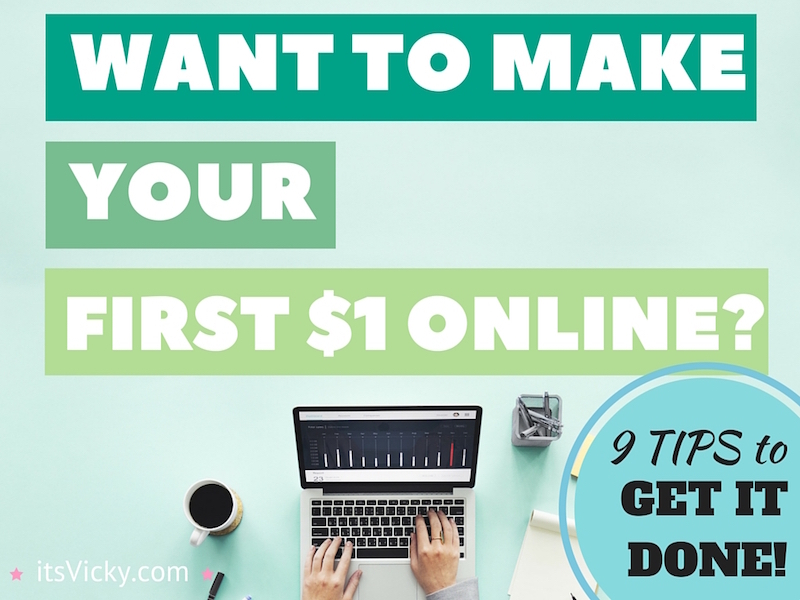 Filed Under: Fridays With Vicky, Want to Make Your First $1 Online? 9 Tips to Get It Done! Detta oss en mycket livsmedelsartikel froma mycket snäll och söt dam ! Look at you John, using your Swedish 🙂 Thank you for the comment!! This is very helpful. I had no idea what the xml sitemap and the all in one seo plugin were all about. The links were informative and I’m not running both on my blog. Thanks.